Sacred Heart Mission's op shops celebrate their Mystery March month with four huge events. Each week, a mystery guest will be announced online and our selected stores will transform into event op shopping hubs. 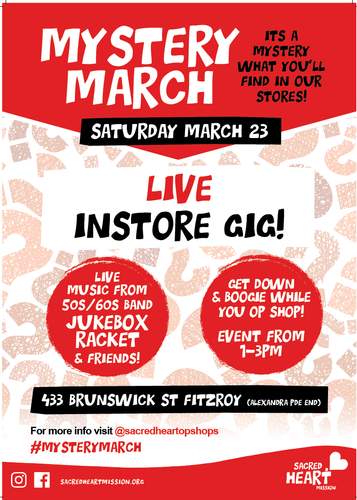 Our Brunswick St, Fitzroy store becomes a live music venue with two huge bands playing in store! Heaps of musical instruments up for grabs and an exciting shopping experience, boogie down while you op shop. Visit our Facebook and Instagram pages for mystery guest announcements, plus special prizes to be won. Follow our op shops on Instagram and Facebook.